During the first phase (2000-2003), further interaction and tuning in took place. For example, after having attended educational sessions on the general health problem of white discharge, women in the community said they knew about it now. But, could Spandana not inform their 'men folk' as well? Spandana indeed started men's groups at a later stage. Women also said they knew about white discharge, but that they would like a gynaecologist to carry out medical check ups. Gynaecological check ups have been organised by Spandana. Later, other women said they would like the messages about contraceptives, safe pregnancy and delivery, to be communicated to their daughters before they left the village to marry. As a result, Spandana is now organising sessions for adolescent girls and boys. Moreover, at the end of Spandana-I, the women indicated that they appreciated receiving all this information, but where could they actually receive good services? This last remark is very much related to activities in the second phase, in which Spandana is collaborating more intensively with existing health services. Also, a trend towards the development of self-help groups can be discerned: some women said they would like to improve their income by organising joint economic activities. 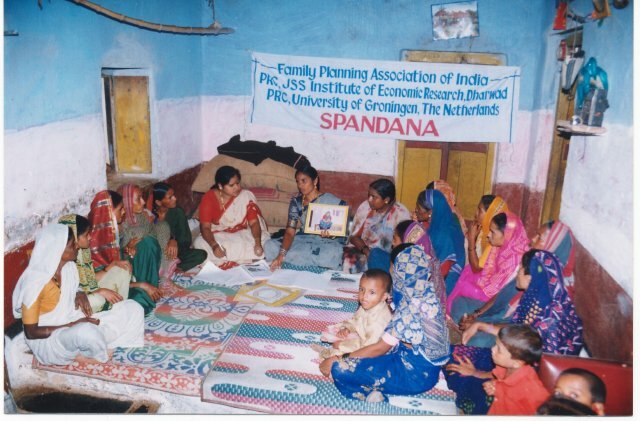 An NGO working on income-generating activities has been established, through Spandana, in one of the bigger villages. These examples do not mean that Spandana satisfies all the needs of the community. If people ask for a hospital, for example, it is clearly beyond the scope of our project.